So Africa is on your bucket list of places to visit, but which part? You might want to consider Namibia because not only has it all the animals you want to see, but it also has got everything from semi-desert vegetation to subtropical plants. Not only that, according to the Lonely Plant guide, Namibia possesses some of the most stunning landscapes in Africa, and a trip through the country is one of the great road adventures. Let’s find out what else in this final part of Namibia with Katie Oxenham, ecologist who worked in Namibia for 2 years as Conservancy and Natural Resource Management Support. Katie was living in a remote area which was surrounded by lush tropical plants along a river in the north of the country. Some of the animals that were counted were the Jennet, a cat like Mongoose or perhaps like a Meercat. In the north of the country the ere more vegetation than the arid areas of the south which are mainly covered with veldt grasses. Northern Namibia has a wet season and a dry season, with open woodland rather than forest. There are some great sights to see in Namibia, which Katie mentioned in part 1 of this interview, like Etosha Nationa Park, and the Petrified forest. You can catch that up by listening to the podcast by searching this blog. 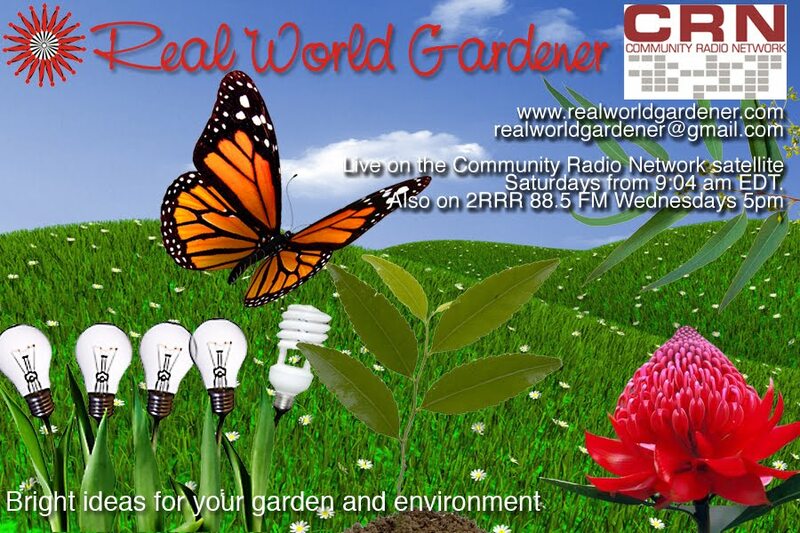 If you have any questions about Namibia or have some information to share, drop us a line to realworldgardener@gmail.com or write in to 2RRR PO Box 644 Gladesville NSW 1675 and I’ll send you a packet of seeds. What is Coriander or Coriandrum sativum? Is Coriander really Cilantro or is that just what Americans call it? Well :it’s just a bit of a technical difference to confuse us poor gardeners. Cilantro refers to the leaves of the plant and coriander refers to the seeds. In Australia we call the leaves and the seeds coriander and some people even call it Chinese parsley. So coriander leaf is nothing else but cilantro. 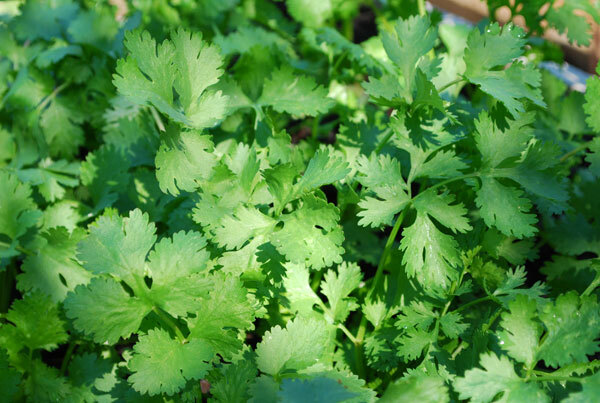 People either hate it or love Coriander because it does have a pungent citrus flavour to the leaves. Coriander flowers belong in the Apiaceae or carrot family, where Parsley, dill and carrots belong. Would you believe that the name coriander is derived from the Greek word koris, meaning bedbug, since the unripe seeds and leaves when crushed supposedly have a smell suggestive of a crushed bedbug? On the other hand, Coriander has been grown for over 3,000 years. Did you know that about half a litre of coriander seeds were found in the tomb of Tutankhamen? Because this plant doesn’t grow wild in Egypt, this suggests that coriander was grown in the gardens of ancient Egyptians. The Chinese once believed it gave you immortality and in the Middle ages it was used as part of a love potions. Coriander is a very familiar herb that we are used to seeing at the greengrocers and in the supermarket. It’s called an annual herb because it flowers, sets seed then dies in under a year.. So why should we grow Coriander. Heaps of Coriander seeds are used in curries, tagines and many other Asian dishes. In fact the whole herb, including the roots can be ground up to make Green Curry paste. Always grow coriander from seed, sown in the exact spot you want it to grow as it absolutely HATES being transplanted. 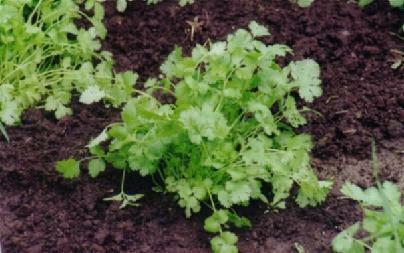 Transplanting coriander stresses it so that it goes straight to seed and then it dies. And you never get any leaves at all! TO GROW IT FROM SEED.. Sow your seeds about 1 cm deep, cover them and keep them moist. Whether or not you sow them in rows, scatter them amongst your other veggies, or use them to grow as a shade plant for your lettuce, it really doesn’t matter. Coriander takes a couple of weeks to germinate, so go do it after my program. 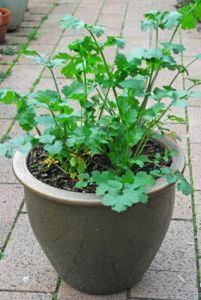 Coriander grow fairly big, about 50 cm or 2 feet tall. Big Tip: Grasshoppers don’t like coriander, so plant it around the spinach to stop the grasshoppers eating holes in the leaves. You want about 5 cm between the plants if you grow it for the leaves..
Leave a few plants to go to seed, yes, on purpose so you have a continuous supply. When your plants is big enough, take the leaves off from the base of the plant. Just make sure the plant is big enough to cope and leave some leaves on it so it can continue to grow. Just remember when coriander plants get stressed, or in hot weather, or once they reach a certain age, they stop making leaves and instead start growing a tall flower stalk. So it’s a good idea to-sow some coriander seeds every few weeks during the growing season. Not only that, it’s a good idea to leave in a few plants that have gone to flower because the Coriander flowers are an important food source for beneficial insects, especially little parasitic wasps and predatory flies. 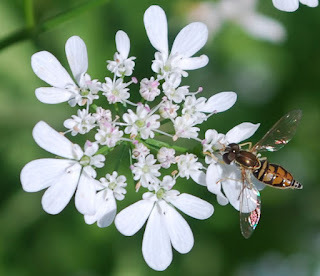 To attract many beneficial insects you want lots and lots of coriander flowers why not sprinkle some coriander and parsley seeds through your other vegetables under your fruit trees and in any other place you can fit them. 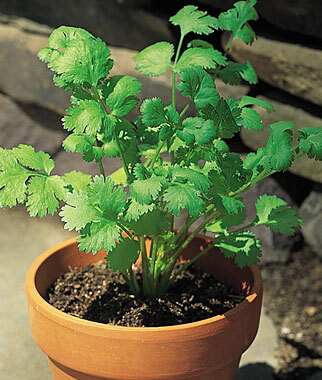 Keep watering and feeding your coriander plants well, and wait for the flower to develop and set seeds. In hot weather this may take as little as 4 - 6 weeks from when you first put the seed in the ground. Fresh cilantro (coriander) should be stored in the refrigerator in a zip pouch or wrapped in a slightly damp paper towel. Use as early as possible since it loses flavour and nutrients quickly if kept for longer periods. Harvesting coriander seed is an easy affair. Just wait till the flower heads are dry. And now you should have enough coriander seed to cook with and still plenty left to throw around your garden next year! Coriander contains no cholesterol; but is rich in anti-oxidants and dietary fibre which help reduce LDL or "bad cholesterol" while increasing HDL or "good cholesterol" levels. It’s also rich in many vital vitamins like folic-acid, riboflavin, niacin, vitamin- A, beta carotene, vitamin-C that are essential for optimum health. Coriander leaves provides 30% of daily recommended levels of vitamin-C.
THAT WAS YOUR VEGETABLE HERO FOR TODAY. 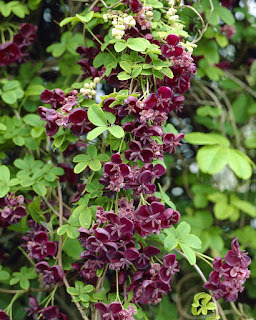 Last week in this new series of scented plants we started with those climbing plants with scent. But there was so much to say, that we had to make another part. 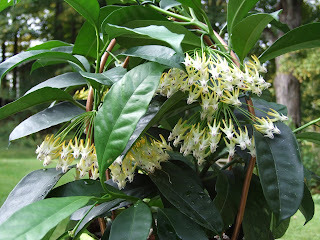 Some of the plants Peter mentioned are Hoya carnose, the Hoya that most people know. There is also Hoya pubicalyx "Red Buttons,' Hoya bella, Hoya multiflora "Shooting Star:, which as a gum leaf shaped leaf. 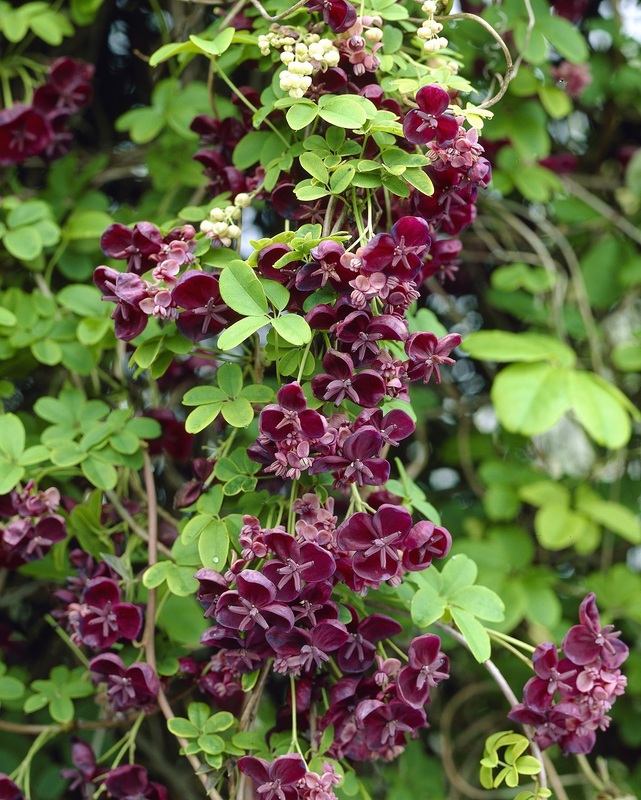 For cooler climates Peter mentioned Akebia quinata or Five Leaved Chocolate Vine. All are good for container planting in a warm temperate climate down to 3 degress Centrigrade. Of course other segments in the series on scented plants will be about scented shrubs, scented trees , scented bulbs, roses, scented leaves, and even a cool temperate segment. All of these plants so that you can turn your garden in to a perfumed paradise all year round. 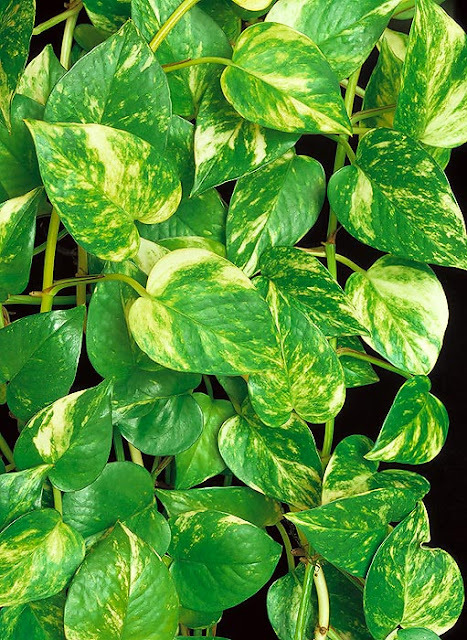 Are you looking for an easy-care indoor plant that will cascade and trail, and soften those hard edges? Are you looking for a plant with health benefits? Because this one (devil’s ivy)is known to efficiently cleanse the air of pollutants. Researchers from NASA discovered that( Devil’s Ivy ) it was one of the top 10 most air purifying plants. The pores in the leaves remove harmful elements from the air and absorb them. 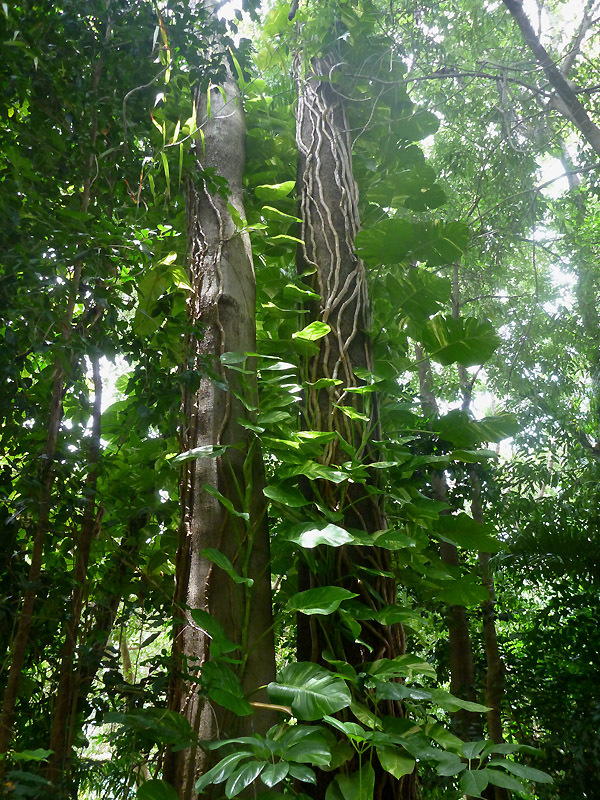 An evergreen vine growing to 20 m tall, with stems up to 4 cm in diameter, climbing with the aid of aerial roots which adhere to surfaces. The leaves are alternate, heart-shaped or ovate (in aureum), entire on juvenile plants, but irregularly pinnatifid on mature plants, up to 100 cm long and 45 cm broad. Leaf colour vary from white, yellow, or light green variegation. This plant produces trailing stems when it climbs up trees and these take root when they reach the ground and grow along it. The leaves on these trailing stems grow up to 10 cm long and are the ones that attach. Avoid if you have house pets that are likely to chew plant leaves, as the plant is highly toxic if any part of it is consumed. Of course you don’t have to grow it indoors because this lush vine does well in most environment's, offering growers a chance to enjoy the plant almost anywhere in the Australia.